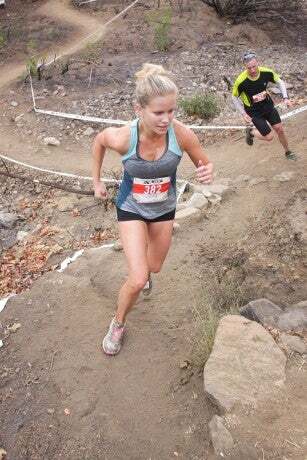 Editor-in-Chief Jessie Sebor shares why she is running the WRS San Diego Half Marathon. On February 22, the entire Women’s Running editorial staff is taking to the streets of San Diego to race our sister race Women’s Running Series San Diego Half Marathon. We’ve never run a race together (for some of us this will be our first 13.1-miler!) and we are all pretty excited about the entire shebang. Leading up the big day, we’ll be sharing our reasons for running and our very best racing tips. I’m racing. . .to win. Just kidding! I’m racing to raise money for Edith Sanford Breast Cancer Foundation. Last year, Edith Sanford signed on as the official charity of the WR Series, and it’s been truly amazing to learn about what they do to prevent and treat this disease. Last year, this hit home when our managing editor was diagnosed with breast cancer. Thankfully, it was caught and treated early, but I’ll be running with friends and family members in mind, including Nicki , who will be racing too! Dream-big goal. . .I want to double my fundraising goal to forward Edith Sanford’s incredible work. If you’d like to donate, just click here. From a personal standpoint, I want to run fast (for me) and hopefully break 1:28 to earn a new personal best. Most psyched on. . .The energy! There’s literally nothing like a women’s only race. The vibe is one of pure support. Everyone cheers for each other—even as they’re racing themselves. I get chills just thinking about it. Race-day must-haves. . . I always have Nuun (an electrolyte beverage), black compression shorts (Saucony makes my favorite pair) and BodyGlide to prevent chaffing (yes, my thighs rub together). Best advice. . . Run by feel. I never wear a watch when I race. For me, it’s a distraction. I run happier (and faster) when I can concentrate on my body and feed off the energy of the racers around me.